Chart No. 22 - Old Moves with New Impetus and Directional Force Applied to Energy Blocks to Release Them. Blocks in the wireless circuits of energy fields are prior to muscle spasms. Positive prana currents of motor energy pass thru [through] the heavy muscles of the back. 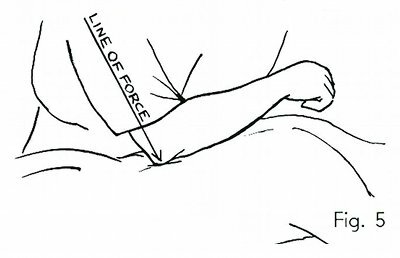 These deep and superficial muscles and connective tissues can be released of energy blocks and waste deposits, by counter impulses of steady directional force applied at right angles to the tension lock. All the contacts given here are for the purpose of releasing energy blocks in the deeper and anterior parts of the pelvis or spine immediately under the contact. 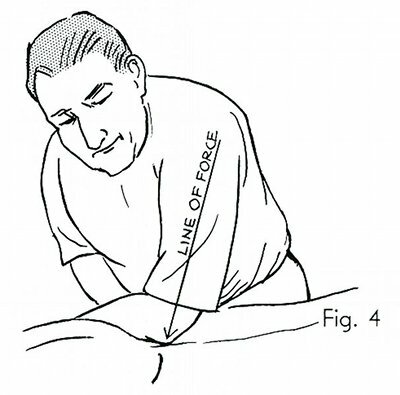 The contact with the elbow must be started gently and increased to the tolerance of the patient. Repeat if necessary, rather than hold too long. Sense the relaxation taking place. Short applications release tension. Long ones exhaust the tissues. Contacts must be held long enough to make a change in the molecular energy circuits and effect the release of spastic muscles attached to vertebrae. (A) All directions of contacts are at right angles to the curve treated. All heavy pressure and forceful technique is dispersing in its effect. It is of the tamas quality of energy, as a potential compelling force scattering accumulations and forcing electrons and molecules to seek other fields of attraction. 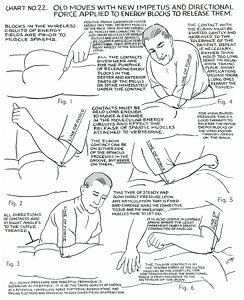 For high blood pressure this is a good therapy to release the motor energy blocks of the vaso motor [vasomotor] tension areas on the back. 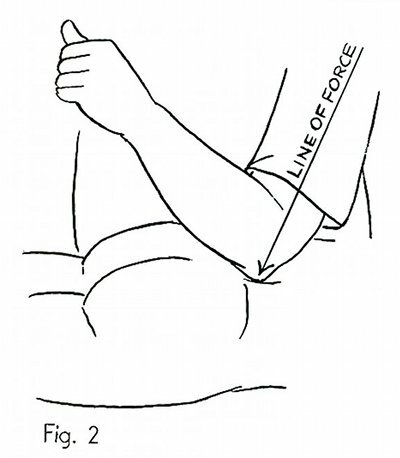 The elbow contact can be on either side of the spinous processes in the groove, but never on them. This type of steady and slow direct pressure upon any articulation that is fixed and chronic gives the connective tissue and the involuntary muscles time to let go. 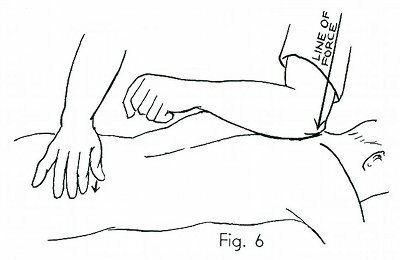 It is also useful in lumbago spasms where the least movement causes a spastic contraction of muscles. The thumb contact is on the tender fibres [fibers] of the gluteus muscles on the short leg side for tension release. 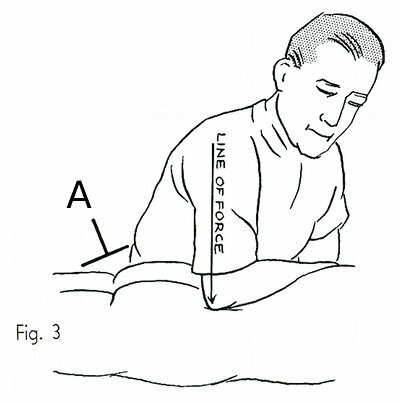 The directional force is from posterior to the anterior of the body.